Are you wondering what this musing is going to be all about? How do cows and pyramids belong in the same story? First let me talk about tipping cows. No I am not talking about teenagers doing their requisite amount of malicious mischief. I am talking about how we all are in process of tipping over one of those "sacred" cows -- in this case, the idea of who can use what bathroom is tied to the safety of women. I have been in many public bathrooms through my life. I have been in men's rooms, in women's rooms. I have squatted in the holes in the floor in France and in China. During my college years I worked summers in the US Post Office on Canal Street in Manhattan where the bathrooms looked just like the video above where there were no walls between the rows of toilets. Long ago, when in the scouts, I learned that the trowel is my friend. This knowledge was always handy on backwoods camping excursions. There were many years, jostling among the beer burdened guys as I found myself shoulder to shoulder with the next guy peeing into the trough at the Fenway Park Men's rooms. This was the worst part of going to see a baseball game in Boston. I so prefer the rows of individual private stalls in the Fenway's Park Women's room today. I never felt "safe" in that old men's room. No never safe -- neither physically nor psychologically. (That's another story but it may not be unfamiliar to many guys). And I'll soon give you ten thousand more. Since my transition, I have never suffered the -- let me call it -- indignity, of the lack of privacy when I needed to use the women's public restroom that I used to in the variety of men's rooms. It makes me wonder what the worries are that the men -and yes, it is mostly men, who are trying to protect the sanctity and safety of "their" women, by creating these so-called bathroom bills. As men, they may still be challenged by the notion of men's rooms where they compared whose "member" is larger, and who can throw their "load" further. For some, they may never have grown out of these cultural competitions that prove nothing. Now, let's flip a pyramid. I do have a particular one in mind. This is Maslow's pyramid of needs. For many years, this hierarchy of needs has been taught, and argued about by management and psychology gurus everywhere. I am not certain if it is still taught, but I do believe it is well within the common knowledge of many that our physical safety and security is at the bottom and that self-actualization is the top-most goal. Also, it seems for so many in the transgender community -- and remember for those of us who are transgender, this is not a choice, it is just who we are, we may actually need to "flip" the pyramid, as our very being -- is dependent on being self-actualized as our true self. 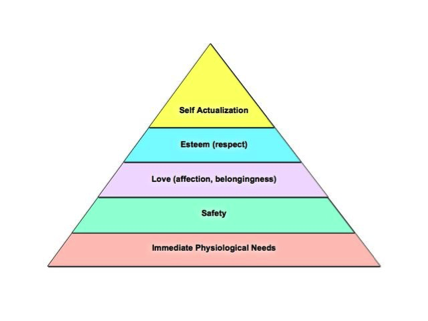 There are many that have to reach self-actualization have given up all the steps below that on the pyramid shown. For many until they live authentically, they really cannot fulfill the needs of physical and emotional safety, or even explore them with lasting, open, and honest relationships. I say, we all must flip this pyramid for our own safety and for the safety of those we love. I say, we must all salute the safety of peeing in private, without someone looking over my shoulder, or even knocking into it. Tipping these cows and flipping this pyramids is all about the real safety for all of us, not the fears of the lost boys who won't grow up. Grace Stevens transitioned at the age of 64 and holds a Masters Degree in Counseling Psychology. She is the author of No! Maybe? Yes! Living My Truth, an intimate memoir of her journey to live authentically. Grace is available for speaking with Live Your Truth: Discover Paths to Improved Performance. If you have a topic that you would like Grace to think and perhaps write about, let her know. Visit her website at: http://www.graceannestevens.com/. Follow Grace on Twitter: www.twitter.com/graceonboard .